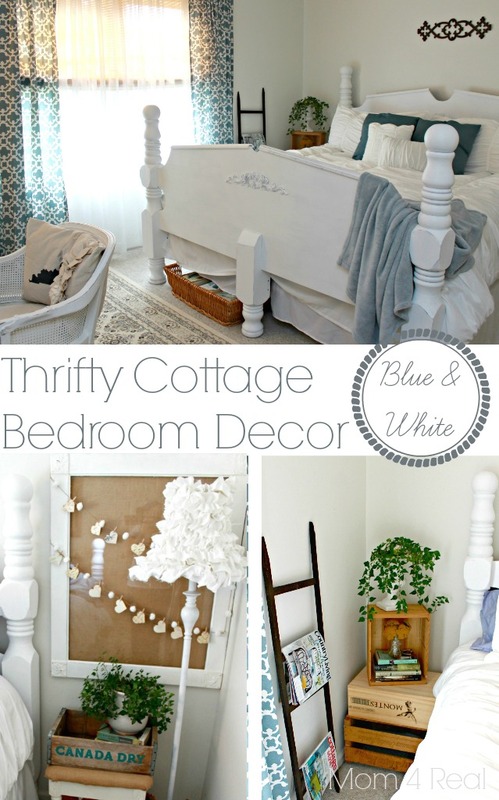 I cannot wait to show you my new bedroom…brace yourself for lots of white and blue, and very little money spending! As you could probably see in the first photo, we have a massive king sized bed. It weighs a gazillion pounds and used to be a country oak color. It was gorgeous, but I am not a lover of oak furniture…at all. I knew I wanted it to be white, so much to my father in law’s dismay, I painted it. Believe me, he wasn’t happy about it, since he had handed the bed down to me…so sorry, Dad! 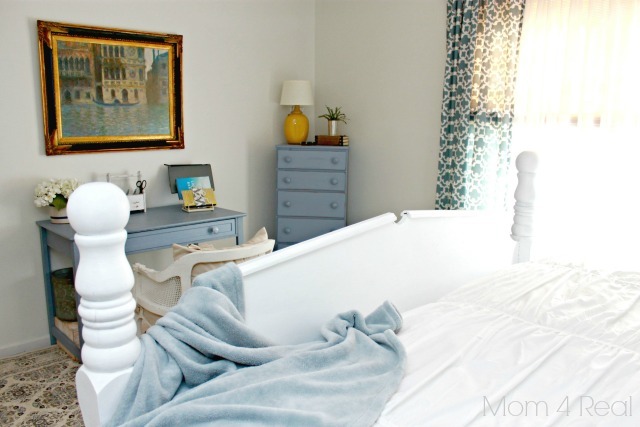 Anyhow…I used some Maison Blanche La Craie in Magnolia that I had left over from an old project to paint my bed…no sanding required! The space between the bed and the wall on the left was tiny, but needed a table. I stumbled on some crates that I had stacked in the garage and checked to see if they fit in the space…they were perfect! I just stacked two of them upside down and a smaller one on it’s side to make a little table. 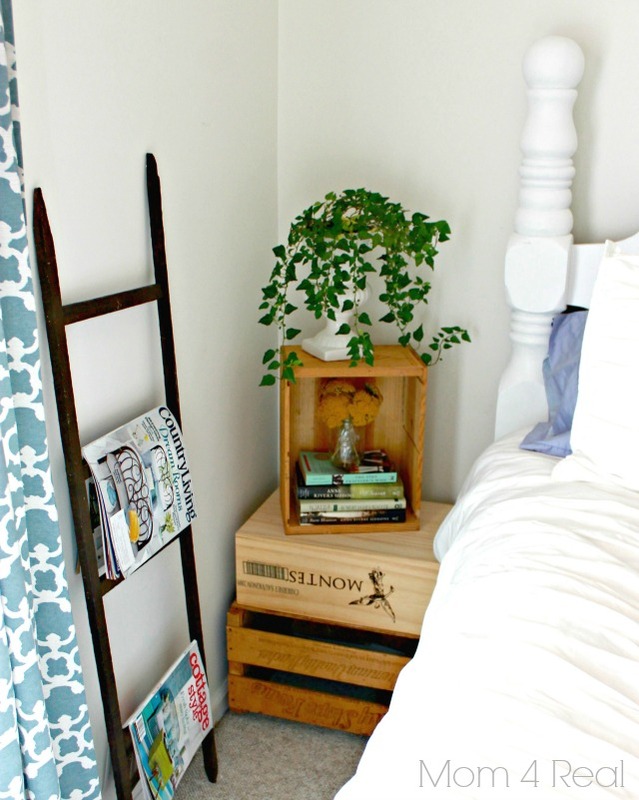 I wanted to be able to sit in bed and read my magazines, so I made a quick ladder from some tobacco sticks…that tutorial will be on the blog next week, and you won’t believe how cheap and easy it is! On the other side of the room, we really needed a space for Matt to work when he has been traveling. Since we live in a smallish house, there really wasn’t space anywhere else in our home, so we had to make it work. I had painted this little desk last year, and it’s been floating around in between our room and the garage, so I knew I needed to give it a permanent space. It was already the perfect color, so I grabbed a sample of the same colored paint and painted the little dresser in the corner so they would blend a little. Normally I would go for another fun color, but I really wanted to keep our bedroom calm and serene. The painting wouldn’t normally be my favorite, but my mom gave it to me, and I just can’t imagine not having it in here. Sometimes I look at it and pretend I am floating down a canal in Venice. The only purchases I made for this room redo were the two blue throw pillows ($24.99 at Marshall’s), and the beautiful billowy bedding that came with a comforter, two King sized shams, two throw pillows and a bed skirt ($69.00 at Stein Mart). So, truly I shopped my home for almost every single detail. It may not be your cup of tea, but no matter what your style is, you can do the same. Taking things from one room that may not work in there any longer, and using them in another room is my favorite thing to do! I love the perfect new additions. Thank you so much, Marty! I kind of love them too! This came out so Beautiful, Jessica! I Love the Softness of the room, it feels so very Relaxing. My favorite part is the Boots on your side of the bed, Just in case you have to make a run for it!!! LOL!! 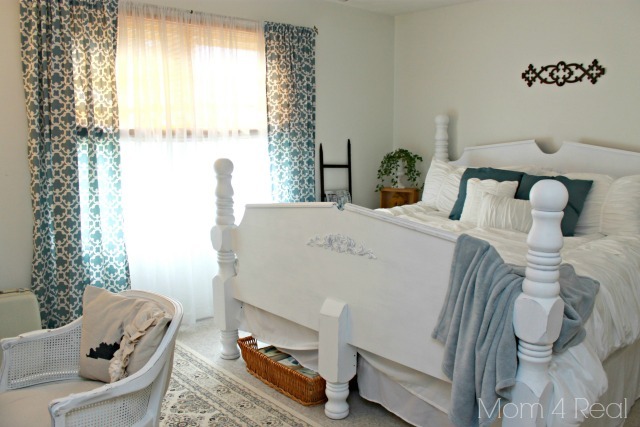 It is so light and airy and cozy looking! Beautiful! I love it. And I love how you added personal touches and items that have a story behind them. Thanks so much for sharing, Jessica! Hope you’re having a wonderful week! Thank you, Abby! It really makes all the difference having that room to escape to! Hope you are having the best week ever!!! Love ya girl! I think it looks amazing! I have the same curtains in my office. I love them. You definitely made the right decision painting the bed! Great job! Thanks, Lisa! Don’t you just love those curtains? I had them in my living room for a while, and now I love them in my bedroom! Love the new look – I’m sharing on my facebook page later today! xo, S.
Jessica I love it all! Love Target too! I think you are brilliant at adding your own style and making your home look and live bigger than it is. Ours is still so very practical in so many places but yours just has such beauty to it. You inspire me to keep trying and redefining my style and updating even the little corners. You’re amazing! Love ‘ya! totally love everything about it; especially that you proved how beautifully we can decorate our homes with minimal expenditures. no more excuses. sorry to FIL but the bed does look awfully good painted. Reared and married to men that are adverse to painting wood I know what you were up against. WHAT IS IT???? Hi, Ruth! The color is Cincinnati Hotel Blue by Valspar. I’ve used it on so many things, it’s absolutely one of my favorites!!! Love the room! I like how you used different shades of blue…it’s beautiful! Have you thought about painting the frame on the Venice painting? I bet it would look much prettier if the frame were white or even one of the blues in the water! Nice job on the room!! I would love to, but it means a ton to my mom. I’m afraid she would murder me ;) I do agree though! Oh your bedroom looks so pretty Jessica. 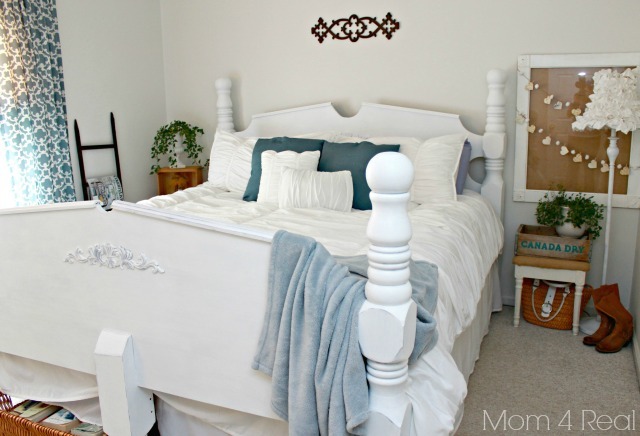 LOVE the bedding, and how you painted the oak and totally updated it. I also love the panels, so pretty! Nice job girl. It looks beautiful!!! Good job!! Love! I love the room for the same reasons behind your vision; the simplicity and calming effect it has. And what you did was so smart. I really admire people who are creative by using much of what they already have. Thanks for the inspirtation! Now maybe I’ll get to work and do something with our master bedroom! Oh Jessica…I love it!!!! You know how I love white and the blue is absolutely perfect! 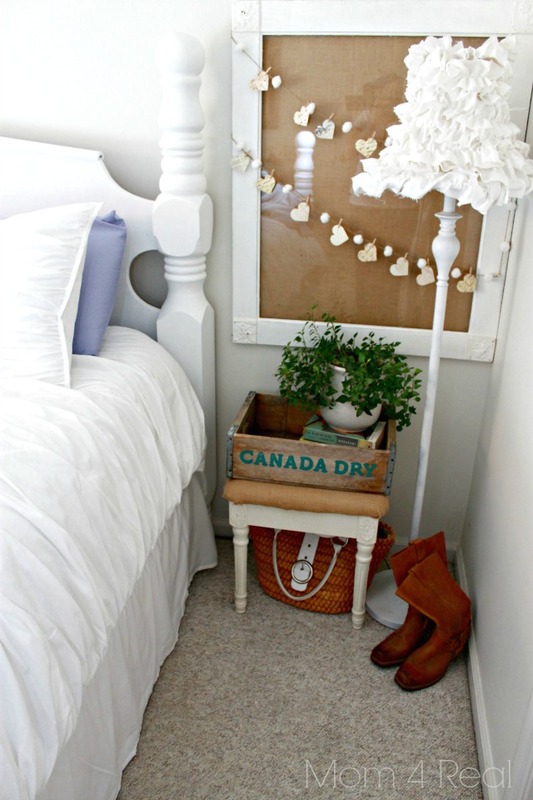 All of the little touches you added are so cute…very smart and great for anyone’s budget. Great job…I love it all! Loved the bedroom. Look forward to more. It looks beautiful! I would agree that you achieved your goal. This is a wonderful country bedroom. Thank you so much, Lynn! It’s the first time in my adult life that I have actually enjoyed spending time in that room:) Have a beautiful weekend! I love your room Jessica! So very pretty. LOVE, LOVE, LOVE it! You did such a wonderful job! I can’t believe you did it on a budget! It looks like a designer did this room! So calming and relaxing! I dislike oak furniture and would love to paint my bed in the guest bedroom. I already use blue and white but the furniture is an ugly oak finish! Such an inspiration! I think I’ll give it try and paint the oak! Thanks for your ideas, I love your website!